Zoltrog's Blog: Zoltrog's Favorite Month Is March... Because Of The Zoltrog Armies Marching! Zoltrog's Favorite Month Is March... Because Of The Zoltrog Armies Marching! Many of Earth's Earth months of the Earth year are satisfactory to Zoltrog. Zoltrog enjoys December, the end of the year, because it reminds Zoltrog of the end of humanity. Zoltrog enjoys January, the beginning of the year, because it reminds Zoltrog of the beginning of the end of humanity. Mwahahaha! But March, that is truly the best Earth month of all. This brings to Zoltrog's superior brain images of Zoltrog's army marching. Marching across the Earth. Marching over land in stylish alien boots. Marching over water is stylish alien boots that are also waterproof but can also fly because they are superior to your puny Earth boots. Mwahahahaha! Nonsense! If Zoltrog wasn't busy laughing over the thought of destroying you, puny human, ZOLTROG WOULD DESTROY YOU! 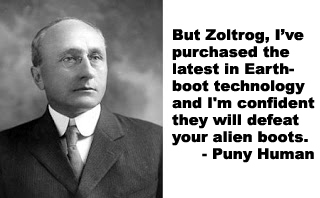 ZOLTROG'S ALIEN BOOTS WOULD MAKE QUICK WORK OF YOUR PUNY HUMAN EARTH BOOTS! THEY'RE ONLY SUCCESSFUL FUNCTION WOULD PERHAPS BE TRANSPORTING THE ASHES OF THEIR NOW-INCINERATED FORMER OWNERS!